Stuart Daniel Baker (born November 7, 1954), better known by his stage name, Unknown Hinson, is an American singer, musician, songwriter, comedian, actor and voice actor. He is perhaps best known for his role as the voice of Early Cuyler on the Adult Swim animated series Squidbillies. Stuart Daniel Baker, a music teacher and studio musician from Albemarle, North Carolina, created his alter-ego for The Wild Wild South, a Charlotte area public-access program that featured comedy sketches and concert footage. Baker and co-star Don Swan played the characters of Unknown Hinson and Rebel Helms, respectively. After Swan's death in 1995, Baker created The Unknown Hinson Show, a direct spin-off of The Wild Wild South. The Unknown Hinson Show won Creative Loafing Charlotte's "Best Of" poll for Best Public-Access Television Show four years in a row. 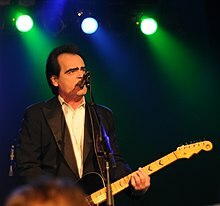 After the series ended, Baker continued in his role as Unknown Hinson, performing live concerts and releasing several recordings. As a live performer, Unknown Hinson has been known to tour for months at a time. Hinson is known to always fire his signature gun on the up swing, a true mark of his skill. He has shared the stage with many notable rockabilly, country, and psychobilly acts such as The Reverend Horton Heat, Marty Stuart, Hank III and Ed King. He has a strong cult following and many high-profile fans, including Ed King, Waylon Reavis of Mushroomhead, Billy Bob Thornton, and Matt Groening. Hank III, grandson of Hank Williams, has Unknown's face tattooed on his biceps. In late 2008, working under his real name of Stuart Baker, Hinson was hired to play bass as well as lead guitar in Billy Bob Thornton's band The Boxmasters. For this hired-gun gig, Baker appears without the familiar Unknown Hinson wardrobe and makeup, instead appearing in a vintage '60s suit, white shirt, and black pencil tie. His manager and booking agent was his wife, Margo Baker (b. 1952, d. 2013). According to a November 10, 2012, post on his Facebook page, Unknown decided to quit touring after 17 years. His planned last three shows were Fort Wayne, Indiana on November 15, Evanston, Illinois on November 16, and November 17 in Covington, Kentucky being the finale. He cited rising costs and indicated his plans to find something new to do. After the death of his wife, Margo Baker, Unknown Hinson resumed touring again. Unknown Hinson writes his own music, performs live, and produces all of his own recordings. His music often parodies the dark elements of today's country and redneck culture. In early 2009, Hinson's 'Torture Town' won in The 8th Annual Independent Music Awards and Vox Pop vote for Best Alternative Country Song "Torture Town". ª Credited on this album as both Unknown Hinson and Early Cuyler the character he voices on Squidbillies. Hinson, credited as Baker, provides the voice of Early Cuyler, a balding hillbilly squid from Georgia, on Cartoon Network's late night Adult Swim program, Squidbillies. The Early Cuyler character echoes Unknown Hinson in several ways, including an affinity for guns and "party liquor", and a "no-nonsense" alpha-male attitude. ^ "Squidbillies Characters". AdultSwim.com. Retrieved 2009-01-05. ^ "It's good to be King: Unknown Hinson is a legend of his own making". TheDailyTimes.Com. Retrieved 2008-08-14. ^ "Into the Unknown | Asheville Arts and Entertainment | Mountain Xpress". Mountainx.com. Retrieved 2011-08-13. ^ "Inside the Heathen Mind of Hank III: An interview with country music's self-exiled prince". Boise Weekly. 2006-08-09. Retrieved 2015-11-18. ^ "Margo Elizabeth Cogan Baker Obituary: View Margo Baker's Obituary by Charlotte Observer". Legacy.com. Retrieved 2013-09-04. ^ "Unknown Hinson: Information from". Answers.com. Retrieved 2013-09-04. ^ "Home". Unknown Hinson. Retrieved 2013-09-04. This page was last edited on 9 January 2019, at 04:09 (UTC).